Edited by John E. Exner, Jr.
Any research that involves the use of the Rorschach or focuses on the nature of the Rorschach must be framed in the context of the basic principles that mark any scientific investigation. However, most texts concerning research design or data analysis do not deal directly with many of the unusual issues that confront investigators who use the Rorschach in their research. The nature of the test and test procedures are somewhat different than for most psychological tests, and, often, these special characteristics become critical when research designs are formulated. Similarly, some of the data of the tests are quite different from the customary distributions yielded by other psychological tests. Thus special care must be exercised when considering the variety of tactics that might might be used in analyzing the test data. This text is unique in that it is specific to the Rorschach. Bringing together experts on Rorschach research, this volume presents in-depth treatments of every facet of methodology -- from design to analysis -- as well as more conceptual issues. It is designed to aid investigators in contending effectively with the many difficult challenges that are often encountered in Rorschach research. This work adds to the information already available to the accomplished researcher as well as provide some enlightenment for the Rorschach research novice. It dispels the notion that rote methodology or analyses can be applied routinely to studies involving the Rorschach. And it helps to improve the quality of investigations in which the test is included, and contribute in some way to the improvement of the overall research yield in the Rorschach community. "John Exner and his colleagues have produced an encyclopedic handbook whose message is clear: The conceptual and methodological challenges in Rorschach research are extensive and ongoing, but the potential yield is great. Their handbook takes the reader through the entire process --from the formulation of a basic stance and the identification of specific issues, through the selection of variables and participants, and on to design and data analysis. The chapters move easily between thoughtful consideration of conceptual issues and down-to-earth recommendations about the pragmatics of collecting and analyzing Rorschach data. The writing is uniformly clear and articulate, no mean accomplishment in a handbook with twelve contributors. This invaluable volume belongs on the bookshelf of every Rorschach researcher, but I doubt that it will spend much time there." "John Exner's new book is a text long awaited by those who conduct research with the instrument. Emphasizing conceptually-based research, the volume provides clear guidelines for choosing appropriate designs, methodology, and statistics. Ideally, this book will spur new interest in Rorschach research, allowing researchers to proceed in areas where they were reluctant to go previously. This edited volume is the next logical step in the evolution of our growing Rorschach technology. 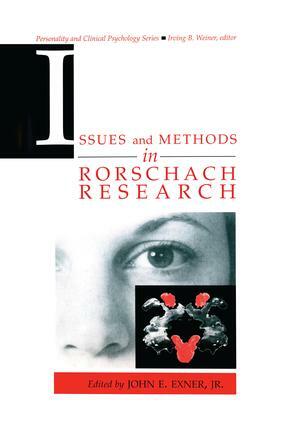 Whereas the Rorschach Comprehensive System provided us with tools for use in the clinical setting, Issues and Methods in Rorschach Research shows us how to apply them to research. This book will be sought as the standard for future Rorschach research." "This is the Beethoven's Ninth of Rorschach research methodology conducted by the maestro empiricist, John Exner." Contents: Preface. J.E. Exner, Jr., Introduction. R.R. Dies, Conceptual Issues in Rorschach Research. D.J. Viglione, J.E. Exner, Jr., Formulating Issues in Rorschach Research. I.B. Weiner, Variable Selection in Rorschach Research. R.R. Dies, Subject Variables in Rorschach Research. B.A. Ritzler, J.E. Exner, Jr., Special Issues in Subject Selection and Design. J.E. Exner, Jr., B.N. Kinder, G. Curtiss, Reviewing Basic Design Features. H. Mcguire, J.E. Exner, Jr., Issues of Probability and Rorschach Research. M.W. Acklin, C.J. McDowell II, Statistical Power in Rorschach Research. D.J. Viglione, Basic Considerations Regarding Data Analysis. H. Mcguire, B.N. Kinder, G. Curtiss, D.J. Viglione, Some Special Issues in Data Analysis. E.A. Zillmer, J.K. Vuz, Factor Analysis With Rorschach Data.